A/B testing gives you the power to optimize a website landing page’s ability to convert customers by offering different variations to the traffic you are already getting. Over time, you will discover which changes to your site create more sales and generate more profit. How do I install ABT? Go to the ABT app page and click the the big “GET” button to connect your Shopify store. I installed ABT, where do I begin? Now that you have the app installed, open the product that you would like to test in your admin area (/admin/products/). After selecting your product, click the duplicate button just beneath the Product Title. Choose the title of the new product (it could be the same if desired) and select the “copy images” checkbox. After you make your change(s), save your product. You’re now ready to create a split test. I would like to split test a product that I am already sending traffic to. How can I change the link to the redirect? Sometimes a link you once shared on social media or in an ad in not editable. This step-by-step procedure will allow you to send existing traffic into a split test. We recommend doing this during off-peak hours so you don’t affect many customers. 1. In Shopify, go to the admin page for the product you are currently sending traffic. 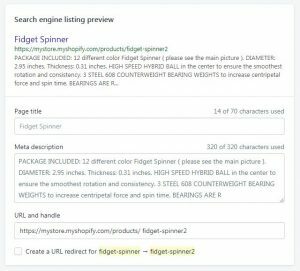 On the bottom of that page, you will see a box that says “Search engine listing preview”. Click the link to “edit SEO information”. When the box expands, you will see the URL of your product. Copy the portion of your URL that follows your domain (including the “/”). Then change the slug to anything else. UNCHECK the create URL redirect. Save your changes. 2. Go to Online Store > Navigation > Url Redirects (/admin/redirects). Click “Add URL redirect”. Under “Old URL,” paste the URL you copied from the product admin page. 3. Open ABT in a separate window. Copy the redirect link that you would like your ads to point to now. 4. 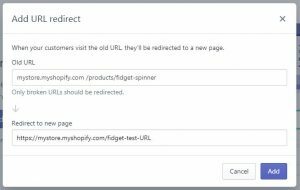 Go back to Shopify’s redirect page and paste the link under “Redirect to new page”. 5. Now all the traffic that was directly linking to your product page will be channeled into your A/B test. How do I determine if a product page is a winner? ABT tracks two important metrics – Conversion Rate and Average Order Value. We recommend letting tests run for at least 7 days in order to gather data across a full spectrum of the week. This will give you the confidence in your result. At the conclusion of this period, you should have enough data to determine a winner based on conversion rate or AOV. If the statistical margin is close, you can let the test run longer in order to gather more data. I found a winning product page. Now what? Once you have declared a winner in your split test, simply allocate 100% of the traffic to the winning product page. Now all visitors will land on the product page that converts the best!